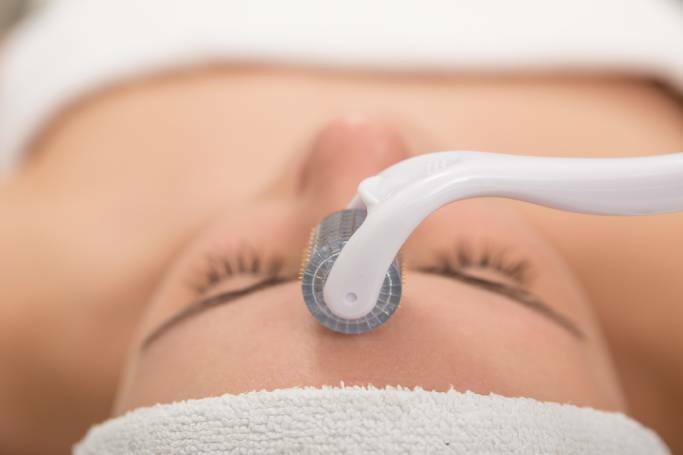 A buzzy new skincare brand called Vice Reversa have launched a new beauty product that micro-needles your face without you having to lift a finger, meaning you can enjoy the benefits of the treatment while you kick back with a glass of vino on the sofa. If you’re not au fait with the concept, micro-needling (also known as dermarolling) is beauty a procedure where hundreds of tiny holes are punctured into the skin using very fine needles. Typically, this is done using a micro-needling device called a ‘dermaroller’ that rotates the needles along the face. The theory is that when the skin encounters a cut, it naturally works to repair itself, prompting a collagen response which can fill fine lines and make the skin appear younger. Usually, people tend to get micro-needling administered professionally, but it’s becoming increasingly more common as a home treatment. victoriahealth.com) contain 380 micro-fine needles that are formed from thousands of crystallised ingredients. When they are smoothed onto the skin, the tiny stalagmites penetrate the epidermis to kick-start the rejuvenating process without you needing to roll a device back and forth. Even though it sounds super painful, the cuts are so tiny that Vice Reversa claim “you won’t feel a thing” while you’re wearing it, although it’s natural to experience a mild tingle. As well as micro-needling the skin, the patches also contain a mix of hyaluronic acid, amino acids and peptides that are said to brighten the skin for a Hollywood glow. To give the at-home trend a go, you simply need to cleanse your face and lay a pair of the micro-needling patches onto the skin, positioning them into the right place. You then sit back for two hours and let them do their thing, although for best results, the brand say you should leave them on overnight. Once they’ve sunk into the skin, you can peel them off and chuck them into the bin. Vice Reversa recommend using the patches twice a week if you’re on the quest for younger looking skin. If you’re trying anything new on your face, it’s always worth doing a patch test beforehand, and if you’re pregnant or have sensitive, broken or damaged skin, we recommend speaking to a doctor or dermatologist beforehand. If you’ve got a phobia of needles but have always wanted to give micro-needling a go though, this might just be the post-pay day treat you’ve been looking for.